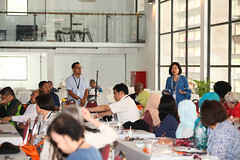 The Academic Forum is a platform of knowledge sharing among librarians to increase understanding of the latest issues pertaining to librarianship and the library. It is a formal activity and held regularly. 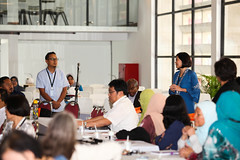 Librarians who have attended conferences are required to provide feedback in the form of presentation with other librarians as the audiences to share the knowledge as well as their experiences. The forum provides an opportunity for these issues to be openly shared and discussed. 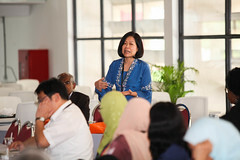 a. Cik Sutarmi Kasimun on 5th International Conference on Libraries : Openness Paradigm : Emerging Knowledge Ecologies, Vistana Hotel, Bukit Jambul, Penang, 25-26 Ogos 2015.
b. Puan Noorsuzila Mohamad on PNC 2015 Annual Conference and Joint Meetings, University of Macau, 27-29 September 2015.
c. Puan Siti Juryiah on 17th International Conference on Disaster & Emergency Management, Barcelona, Spain, 26-27 October 2015.
d. Encik Mohd Faizal Hamzah on Asia-Pacific Library & Information Education and Practice (A-LIEP) Conference 2015, Manila, 27-31 October 2015 and 7th International Conference on Qualitative & Quantitative Methods in Libraries, Paris France 26-29 Mei 2015. Light refreshment is served at the end of the forum and librarians then get a chance to mingle and network in a relaxed and casual setting.